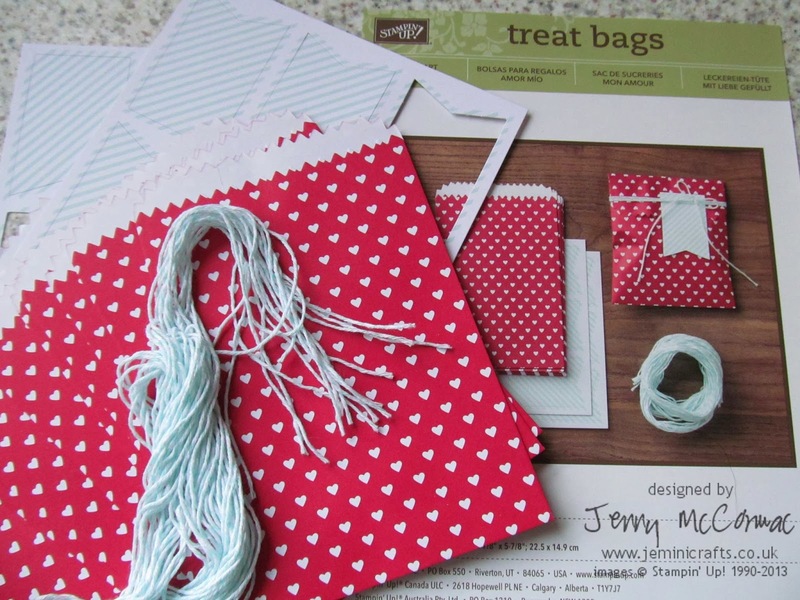 Jemini Crafts: Sweet Gifts - but not only for Valentines ! Sweet Gifts - but not only for Valentines ! I have made some cute gifts to send out to those people who have been enquiring about joining my team or joining my Monthly Club. 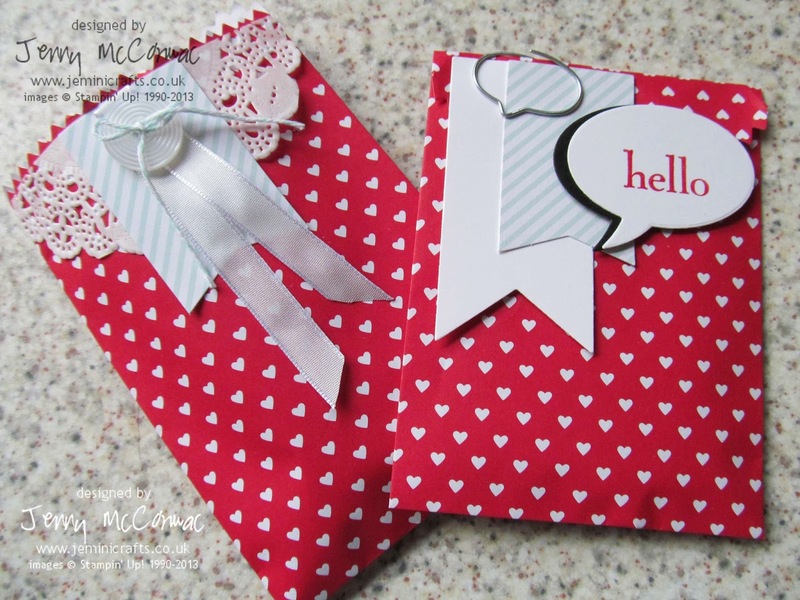 Although these items are from a Valentines kit called 'Sweetheart Treat Bags' they are cute enough to be used for anything. Bright cheerful little bags with white hearts on a red background makes a perfect gift for anyone. Mine are filled with some surprises - by way of a little thank you. Aren't they cute? The kit comes with the bakers twine, the little stripe banners and the bags themselves - at £4.50 for 12 sets, that's less than 38p per bag! Would be great for little thank you's for loved ones or party favours/wedding favours! Know anyone recently engaged? Did you spot something new on the right hand side bag? 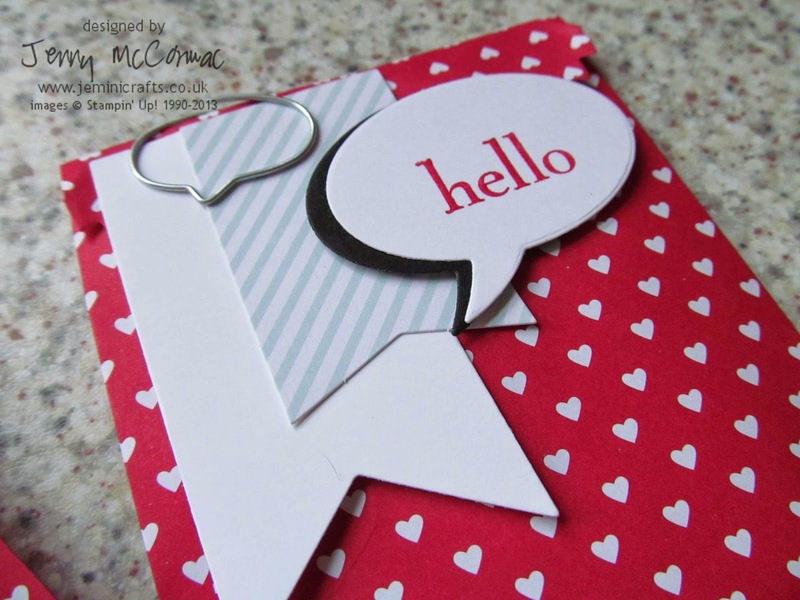 That's a sneak peek for a new products - framelits that are 'word bubbles'. I have just used 'Hello' on mine, but of course there is a matching stamp set with some fantastic phrases. The Framelits do require use of a Big Shot diecutting machine - ask me for more details. Close up of a forthcoming new product! Finally a shot of the kit itself. The open bag size is 9cm wide x 14 cm high. If you would be interested in finding out about Joining my team or my Monthly Craft Club, please use the links at the top of this page. To view the kit online, please click HERE It's only available until the end of January.